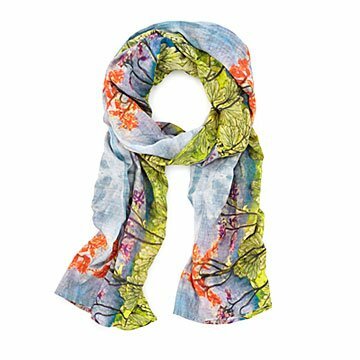 This soft, inviting cotton scarf was inspired by the beauty of flower-filled meadows. Inspired by the clearings she stumbled upon on her fair-weather woodland walks, Neena Jhaveri crafted this soft, inviting cotton scarf with the aid of fresh-picked flowers. Packed with floral imagery accented by the bright blue of the sky, it adds color to cozy outfits and serves as a reminder of warmer days in winter months. Handmade in India. Born in Ahmedabad, India, Neena Jhaveri has had an appreciation for all forms of beauty since childhood. She followed her father's advice that her university studies should focus on the sciences as well as the arts. Although her passion has always been in the arts, spirituality, and nature, she learned long ago that science, the arts, and religion coexist harmoniously. Today, Neena continues to produce her unique designs as limited edition silk and cotton products (made with natural fibers) and exceptional works of pottery. She finds pleasure in creating beautiful things, and a dream come true in sharing these creations with the world. Hand wash cool, tumble dry low, cool iron.